I can tell that I’m ready for summer to be over because I’m having more cooking failures than usual. Distraction, stress, exhaustion–all culprits. A couple weeks ago I tried to make this great sounding salad with caramelized fennel and bacon from a Giada recipe. I followed her recipe exactly, but rather than check on the oven full of fennel and bacon like I normally would, I let it run until the timer binged. What I took out of the oven was a blackened sheet of charcoal that had once been something edible. It was like a nuclear holocaust on my dinner salad. It fused itself to the cookie sheet so badly that after 3 attempts at cleaning it I had to throw it out. And now this. 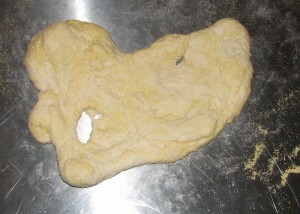 My go-to Whole Foods pizza dough staged a revolt. But I think this also comes down to me not paying enough attention. I froze the dough when I bought it, and when I thawed it out the dough expanded so much I thought the plastic bag it was in would burst. Eventually the air let out and it seemed fine, but I should have suspected that I’d altered it’s original state too much. Tonight when I tried to make a late dinner after my night at work, this was as close to a round pie as Adam or I could get. It tore like crazy and just would not stretch out nicely. Maybe I could have worked it out if I wasn’t trying to make a pizza at 10pm, maybe not. We called out for pizza instead.